The Truckee Half Marathon, Truckee 5K, and Truckee Kids Running events feature beautiful courses with a back drop of Historic Downtown Truckee. You will find answers to the most commonly asked questions below. 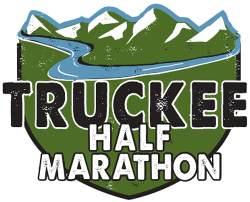 Is the Truckee Marathon a Boston Marathon qualifier? Will the race sell out? Many of our events are set up for a maximum number of participants and therefore do sell out. Register early to save your spot and to pay a lower registration fee. Fees are increased on a tiered basis as the event date nears. Are there official cut off times? Yes: Half Marathon cutoff time is 3 hours 30 minutes . Runners and Walkers must maintain a 14:50 average per mile pace to stay ahead of our course sweep. Individuals may still complete the course after these cutoff times but their results will not be officially recorded and there will be no course support or traffic control. Participants that fall behind the course sweep must obey traffic laws, as we cannot control traffic past sweep times. There is no cutoff for the 5K or Kids events. All runners receive a race bib, timing chip, sponsor promos, recovery nutrition, cold beverage, and event t-shirt. Half Marathon finishers receive a finisher medal. What are the finisher medals like? Who gets a medal? All finishers of the Truckee Half Marathon will receive a finisher medal. Each year there is a new medal design. What is a mixed running surface? The course will follow on a mix of paved road, paved trail, dirt trail and dirt road. The mix is approximately 80% paved and 20% trail. The use of personal music devices is discouraged at this race. To enjoy all that our race has to offer and for the safety of all participants, the Truckee Half Marathon, Truckee 5K and Truckee Kids Running encourages a headphone-free environment during the event. Comfortable ones! Road shoes will be fine for this race or if you exclusively run in trail shoes those will work as well. Are the roads closed to traffic? Roads are not closed to traffic. However, we have designed the course to travel on many of Truckee’s outstanding trails. And we have worked with the Truckee Police Department and California Highway Patrol to provide intermittent traffic control at crossings and intersections. How is the course marked? The course will be marked with arrows, signage, flagging and course marshals. Examples of the course marking will be shown at packet pickup and during the athlete meeting. Dogs are not allowed on the course. At the main venue, if planning to bring or have a dog with you, we recommend using a leash as there will be many people moving quickly. Parking is available on many of the streets near the venue. This is mostly metered parking so make sure to purchase the correct amount of time. Parking is not available in the lot where the event is staged. Do I have to qualify? You do not have to qualify, the events are open to all. Stollers, skates, hover boards, etc. For our safety plan, strollers, skates, skateboards, hover boards, and other such modes of transportation are not allowed. Your results will be available on the Results board near the finish line at the expo. Also on our result page at http://truckeemarathon.com/results. Is there a refund if can't participate? Refunds are not available for this event for any reason, including cancellation, inclement weather or athlete injury. We also strictly do not allow athlete-to-athlete transfers, for any reason. If the event is NOT sold out, a discount code for 75% of your race registration fee will be offered until 14 days prior to the race date. No discounts codes will be given within 14 days prior to the race date. If the event IS sold out, a discount code for 100% of your race registration fee will be offered until 21 days prior to the race date. Discount codes can be used to register for another Big Blue Adventure event (http://www.bigblueadventure.com/events) and will be valid through the following event year.